In October 1915, Simmons recruited 34 members to become his Knights of the Ku Klux Klan, which he later incorporated. On Thanksgiving Day, Simmons and 19 of his Knights marched up Stone Mountain and lit a cross on fire. The burning cross marked the beginning of the second order of the Klan. However, a dentist, Hiram Welsey Evans, eventually wrested control of the beloved order from Simmons. Evans, the newly appointed Imperial Wizard, continued Simmons’s vision of an advanced fraternity. Such is the standard story from Frank’s demise to Simmons’s creation to Evans’s control. This narrative binds the lynching of Frank to the stellar rise and fall of second Klan. But what is missing is not the 1920s Klan’s dedication to nation, the rights of white men and the vulnerability of white women but the prominent place of religion, specifically Protestant Christianity, in the Klan’s print culture, fraternal ritual and theatrical displays. When we place the Klan’s vision of Protestantism at the front and center of our analysis, a different presentation of the order emerges that illuminates the dominance of the Klan’s racial, religious and intolerant views in America from the 1910s through the 1930s. In the many tellings and retellings of the Klan story, narrators mention Simmons’s religious involvement but it is not essential to the story. Simmons was formerly a minister, who created a new Klan firmly enshrouded in the language of Protestantism. For the first Imperial Wizard, God had smiled upon America. It was momentous that he founded the Klan on Thanksgiving Day, a day of celebration of the Pilgrims, who came to the New World in search of religious tolerance. As the angels had smiled upon the Pilgrims, so they did upon the new order. Faith was an integral part of that incarnation of the order. Simmons articulated the religious vision, which Evans and many Klan lecturers (often ministers) continued. 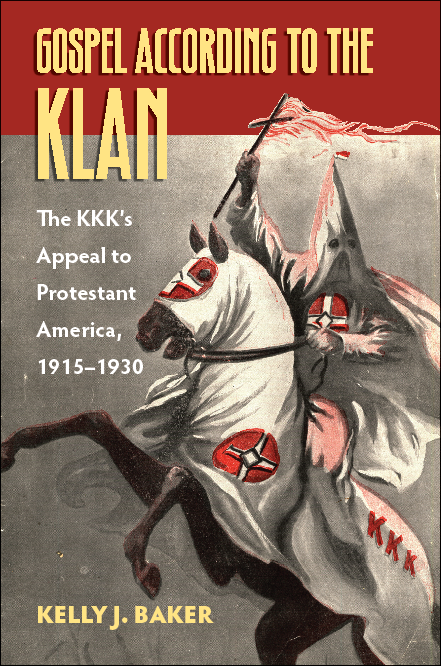 The Klan, for Simmons and Evans, was not just an order to defend America but also a campaign to protect and celebrate Protestantism. It was a religious order. The popular story, however, neglected the place of everyday religion within the ranks of Klansmen and Klanswomen and instead focused upon the Klan’s vitriol towards Catholics, Jews and African Americans. The focus on “Old Glory,” the flag, and patriotism resonated in various telling, yet the emphasis upon the dedication to the “church of Jesus Christ” remained underplayed and under-analyzed. Protestantism became secondary in descriptions of the Klan because of the order’s apparent nativism, racism and violence. The Klan gained a following because of its twin messages of nation and faith, and the fraternity progressed because of members’ commitment to its religious vision of America and her foundations. Moreover, those twin messages resounded because of social change in the United States. Immigration, urbanization and the internal migrations of African Americans made the Klan’s white, patriotic and Protestant message appealing. From 1890 to 1914, over 16 million immigrants arrived in the United States, and ten percent of those immigrants were Jewish. As historian Jay Dolan reported, a vast majority of those immigrants were Catholics from Ireland, Germany, Italy and Poland. In reaction to immigration and World War I, nativism emerged as a popular response to “hyphenated” Americans. Immigrants groups, who did not support the war, were even more suspect. As sociologist Kathleen Blee noted, “The Klan’s underlying ideas of racial separation and white Protestant supremacy…echoed throughout the white society of the 1920s, as religious and racial hatreds determined the political dialogue in many communities.” White supremacy was a common belief in the early twentieth century, but the Klan’s political action, public relations campaigns and the production of material artifacts identified it as a distinct movement. By 1918, there were fifteen chapters of the new Klan. With rising popularity, Simmons, and later Evans, sought to eliminate the violent image of the Reconstruction Klan without much success.